San Jose Mission was the fourteenth one built in California, founded June 11, 1797 by Father Fermin Lasuen. The name Mission San Jose is in honor of Saint Joseph, the foster father of Jesus Christ and Patron of the Universal Church. The restored mission church still stands, along with some parts of the mission quadrangle, which now house a museum. If you're here because you want to visit San Jose Mission, you may want to read up on its history first. That's on the next page. You can also continue through this guide to take a look at some pictures or just get the location which is below. If you're looking for background material for a California Fourth Grade report, use this page and the mission history on the next page. If you're building a model for your project, continue to check out the layout and floor plan and take a look at the pictures. Where Is the San Jose Mission Located? Mission San Jose is located not in the city of the same name but in Fremont, east of the San Francisco Bay. Mission San Jose is located in Fremont, California. You can get there on I-680 or I-880 by exiting at Mission Blvd. Going south on I-680, continue south. Going north on I-880 or I-680, continue north. Mission San Jose is on the east side of the street. The Franciscan missionaries hoped to create a mission "chain," each a day's ride apart on horseback. In 1796, they were well on their way, with 13 of them along the California coast. El Camino Real, the road joining them, was a well-traveled road joining north and south, but there were still long dangerous stretches with no stop nearby. Father Lasuen and the new governor decided to create five more missions. The first of the five, and the only one east of the San Francisco Bay, was founded on June 11, 1797, by Father Fermin Lasuen. No one knows exactly why San Jose Mission was built here, but some have suggested that the missionaries wanted to keep it further away from the new city of San Jose so the Indians would not be tempted by the city ways, or that it was a good place for the military to protect travelers crossing the mountains. It was located near the Ohlone Indian village called Orisom where the town of Fremont now stands. It was named for Saint Joseph, the foster father of Jesus Christ and Patron of the Universal Church. After the dedication, the soldiers quickly built shelters for themselves and the priests, and within 3 weeks, there were seven more buildings laid out in a rectangle (instead of the square pattern used elsewhere). They received supplies and gifts from nearby mission settlements to help them get started, including more than 500 head of cattle and a large flock of sheep from Santa Clara. The Ohlone Indians did not want to change their way of living, and in the beginning, the fathers found it difficult to get them to move in. Only thirty-three Indians were living at San Jose Mission at the end of that first year. However, the location had military importance, near the western approach to the Central Valley. 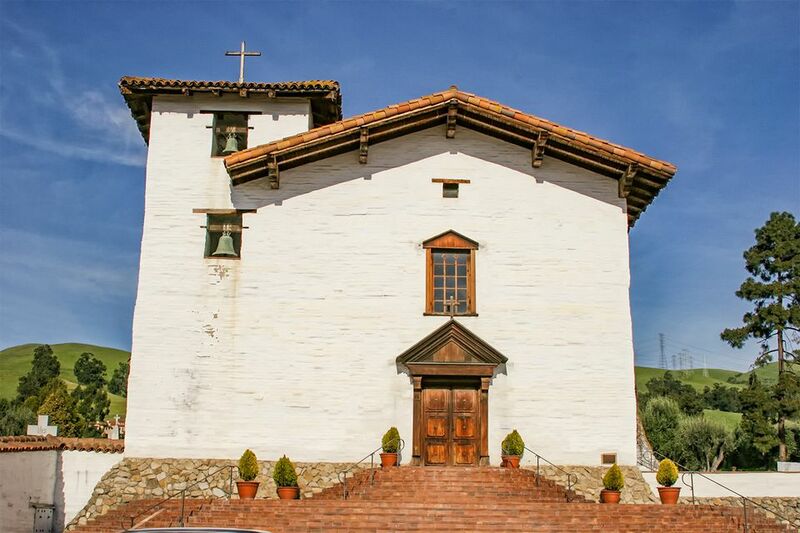 Around 1805, Father Jose Fortuni and Father Narciso Duran arrived at San Jose Mission. They worked together to attract the Indians and trained them as weavers, blacksmiths, rope makers, leather tanners, tile and adobe brick makers, shoemakers and carpenters. The women learned to sew, spin, cook, launder and do needlework. In 1805 a new church was started and it was finished on April 22, 1809. It was a simple, solid building with walls 8 feet thick in some places. San Jose Mission prospered in the 1800s and it controlled all the land around it, north almost to Oakland, east into the Livermore Valley and up through the Sacramento Delta and west towards the Bay. The small herd of 500 cattle grew to 350,000 - the largest herd of any mission. With so much land, the agricultural output was second in the territory, and its olive oil production was the highest. By 1816 they were trading Indian-made goods for coffee, sugar, spices, hardware, fabrics, and supplies. They even bought a boat and sailed across the Bay to trade with ocean-going ships. New homes were added as needed because by 1825 they had more than 1,800 Indian neophytes living there. In 1830 there were 2,000 making it the largest Indian population in northern California. In 1833, San Jose Mission was one of the most prosperous in the territory. A church inventory, listed the church building, monastery, guardhouse, guest house, and women's dormitory, in addition to the thousands of acres of crops and grazing land. In 1833 leadership was given to the Mexican church leader Friar Rubio. The Spanish priests left, Jose de Jesus Vallejo was appointed civil administrator and within three years the lands, which were supposed to be given to the Indians, were divided into ranchos. The church was apparently plundered by Vallejo and there was little left to sell. At the end of the Mexican War in 1848, California was given to to the United States. During the Gold Rush, H.C. Smith converted the buildings to a place of lodging and added a general store to the south end. The town became a thriving provision center at the gateway to the southern mines. Names of many pioneer families prominent in early California history - Livermore, Peralta, Alviso - were closely linked to San Jose Mission. In the later part of the 1850's, the Catholic Church was given the church building as well as some of the land that surrounded it. The church was severely damaged in an earthquake on October 21, 1868 and a wooden building took its place. In 1956, the town incorporated with four others to become the City of Fremont. In 1982, the wooden building was moved and rebuilding began. The San Jose Mission church was restored to look like the original and construction began in 1982 and was completed in 1985. The original mission church was a temporary thatched roofed structure. It was replaced when a new church building was started in 1805. While it was not elaborate, it was solid: 125 feet long, 30 feet wide and 24 feet high with walls four to five feet thick and 500 giant redwood trees used for the ceiling beams. It was finished on April 22, 1809. In 1827, the mission quadrangle was completed, with sides 900 feet long. The inner patio was surrounded on three sides by buildings and by a ten foot high wall on the fourth side. Normally, the mission church was in the corner of the quadrangle, but at Mission San Jose it was in the center of the front side. There was a soap factory and a tannery here, and a hot water fountain from the nearby hot springs was used for bathing. The Indians' adobe homes were behind the quadrangle along with a kitchen garden, orchard and vineyard. In 1868, an earthquake damaged the adobe church, breaking open the roof, breaking one of the bells and destroying the mission walls. The broken bell was repaired and used by a church in Oakland. In 1890 a wooden church was built on the old foundation. The three unbroken original bells were used until 1970 when the tower holding them became unsafe and they were stored. Finally, in 1973 a committee was formed to restore Mission San Jose. The wooden church was moved away and the first part of the restoration was completed in 1985. The reconstructed mission looks like it did after it was redecorated, during the years 1833-1840. A few items from the original mission remain. The fourth bell was returned and all were rehung in 1984. The original copper baptismal font, decorated by the famous Mexican artist Augustin Davila survived the earthquake. It sits on a wooden stand that he also decorated. This model shows Mission San Jose at its peak, with two quadrangles joined in the middle. The Mission San Jose picture above shows its cattle brand. It was drawn from samples on display at Mission San Francisco Solano and Mission San Antonio. These are the four original bells, now reunited in their tower. There is a striking contrast between the ornate altar, highly-decorated walls and the plain wood ceiling. San Jose was a very rich and successful mission at its peak and it had ornamentation to match. This is a small example of the richly decorative painting on all the walls. Early graves were marked with wooden crosses and have been lost.